Eckersley O’Callaghan’s Digital Design Group has developed a bespoke software that reveals the most efficient solution for any given engineering problem. Amongst its many applications, it can find the minimum weight of steelwork required for a structure in a matter of minutes. The software is a plugin component for parametric software Grasshopper and is based on the Nelder-Mead search method which significantly cuts down the time taken to otherwise perform thousands of complex computational calculations. It is simple to use with informative user interface providing live feedback on the progress of the optimisation. The challenge of finding the most efficient solution from an infinite number of possibilities is a classic problem in engineering. 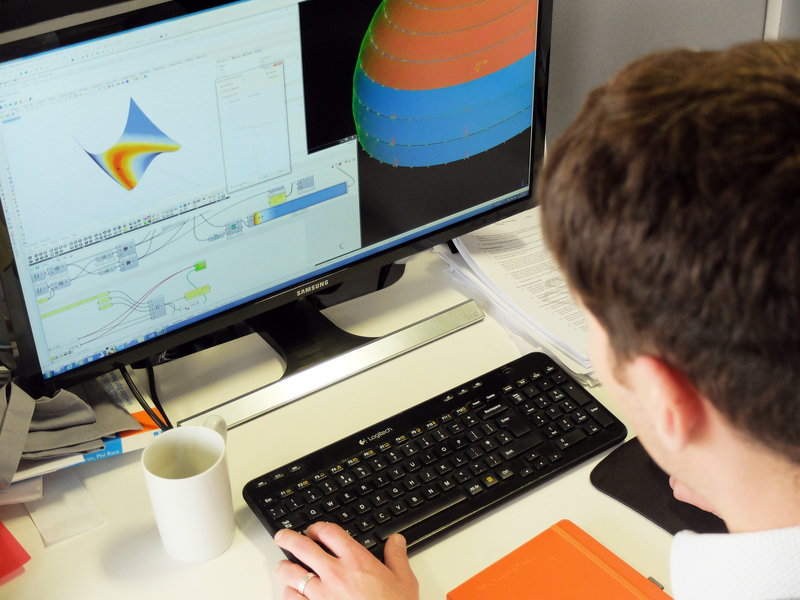 This often involves an iterative process of assessing many different options – for example, measuring structural performance using a finite element analysis (FEA) computer programme. Each individual iteration may take seconds to perform; but rigorously working through thousands of options can take hours or days to reveal a good solution, without guaranteeing that the best is found. The Nelder-Mead method is a strategy for finding the optimum solution presented by John Nelder & Roger Mead in 1965. It is based on defining a region in which the optimum solution is known to exist, then progressively honing in towards that solution by testing specifically chosen iterations for improvement. The Nelder-Mead Optimisation Component for Grasshopper can be downloaded here. for further information on our Digital Design Group.